Long An (VNA) – The summer-autumn rice crop in the Mekong Delta province of Long An is estimated to give a record yield of more than 1 million tonnes this year. 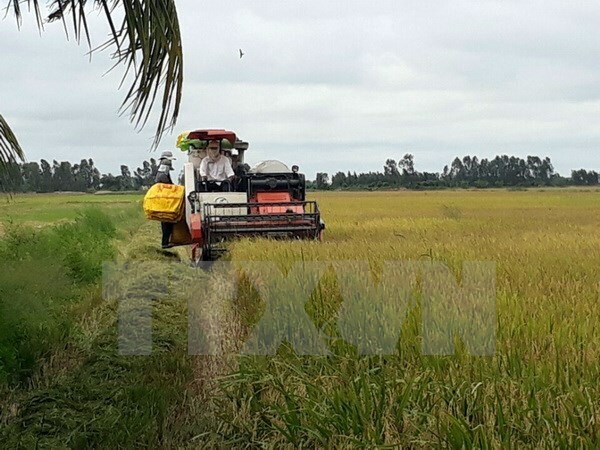 Farmers in Dong Thap Muoi (Plain of Reeds) in the province have so far harvested more than 90 percent of the summer-autumn rice crop out of the total 224,000 ha. Director of the provincial Department of Agriculture and Rural Development Le Van Hoang said only over 100ha of the summer-autumn crop was lost due to flooding this year. The provincial authorities asked for the State funding worth 20 billion VND to upgrade dykes and protect more than 200,000ha of rice in Dong Thap Muoi, and additional 3 billion VND (130,000 USD) to repair pumping stations in Tan Hung, Vinh Hung and Kien Tuong townships. The province has also paid attention to flooding control and building transport routes to prevent floods and serve Dong Thap Muoi tourism.